Eggplant is one of my daughter Jennifer's favorite vegetables. The other day I was trying to think of different things I could do with it and this recipe - which I had almost forgotten about - popped in my mind. I first found it on the Better Homes and Garden website, but tweaked it a bit. The cheese could easily be left out to make this dish dairy free - and while it couldn't really called a caprese salad anymore - it would still be delicious! To grill eggplant: cut off ends, slice 1/2 inch thick, brush eash side lightly with olive oil, and sprinkle with salt. Place directly on grate over medium heat. Grill about 5 to 7 minutes per side until their are nice grill marks and the eggplant has a brown exterior but is soft inside. Place the dried tomatoes in a bowl and pour the boiling water over them. Set them aside and let them sit for at least 20 minutes. Cut the eggplant into half inch slices. Brush each side with olive oil and sprinkle with the salt and pepper. Place the eggplant slices on a grill over medium heat. Cook about 5 minutes on each side until the eggplant has nice grill marks and is brown but not burnt. After the 20 minute soak, drain the dried tomatoes, dice them up, and place them in a food processor along with the basil, 1/4 cup olive oil, and vinegar. Blend until finely chopped. Slice the mozzarella into slices. 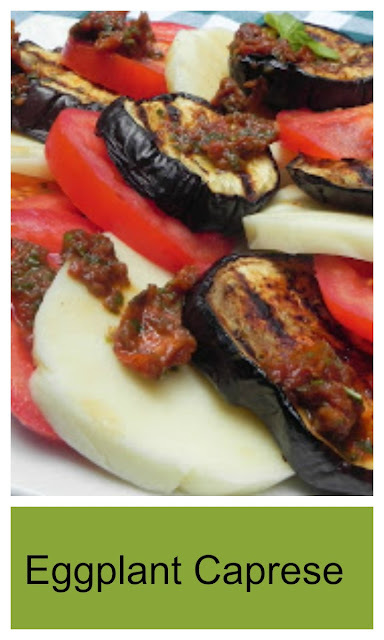 On a platter, alternate and arrange the mozzarella, tomato, and eggplant slices. Spoon the dried tomato mixture on top and garnish with the fresh basil leaves.